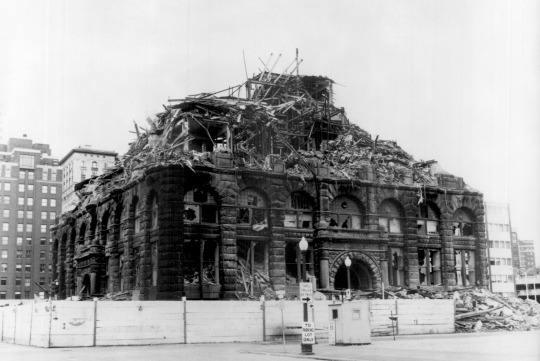 The Metropolitan Building (originally the Northwestern Guaranty Loan Building) was razed in 1961 and, as a victim of urban revitalization efforts to clean up Washington Avenue/the Gateway District in the 60s, was one of the events that sparked the historic preservation movement directly after. It was believed these old buildings were scaring people away from downtown, and thus became one of many great designs that met its end at the hands of a wrecking ball. Minneapolis had a "skid row" around the Washington Avenue/Hennepin Avenue intersection, which is now covered by surface level parking lots and green spaces in downtown Minneapolis. Those weren’t always there. Imagine a downtown Minneapolis full of historic structures next time you drive through. The Minnesota History Magazine has a great summary of the building in the fall 1992 article, "Ghost of the Gateway: The Metropolitan Building, Minneapolis." Click on the title to access it! The loss of “the Mighty Met,” as it was called, was a real tragedy. Think of what the Gateway District (Washington, Nicollet, and Hennepin Avenues) would look like now if that building was still there! These photos to the left are a sort of illustrated journey of the iron balustrade sections that come from the Metropolitan Building, some of which we had in our inventory. The interior of that building was truly something breathtaking and unique. The demolition of the Met is often pointed to as the watershed moment that sparked the preservation activism efforts here in Minneapolis and even around the United States. A two-day demolition sale is the real reason why these balustrades are still floating around- but they are still very rare. You can never expect to just run upon one of these at just any old salvage place. These are museum-grade examples of the ironwork that graced the Metropolitan and other Minneapolis buildings built in the late 1800s. The slanted rail is from the stairway sets. How cool is that? This section of an elevator cage can be attributed to the old Minneapolis Metropolitan Museum. It made another great addition to our other pieces from the building, which include a collection of iron balustrade sections. A beautiful and rare piece of Minneapolis history! Another historical building that fell victim to urban renewal was the last standing piece of Metropolitan Stadium, torn down in 2014. "The “East” parking sign was located in the North parking lot at Mall of America. It was the final piece of decades of Minnesota history that took place at Met Stadium. The sign will be donated to the Juvenile Diabetes Research Foundation to be auctioned off in support of Type 1 Diabetes research." As an architectural salvage company, the destruction of structures like this is bittersweet. While we obviously love architecture and old stuff- that’s why we are in the business- the death of old historic structures gives us a niche to fill. Restoration and preservation of buildings like these maintain an area’s sense of place and character, but demolitions are also part of what creates a market for re-purposed and re-used architectural elements. Personally, we believe in adaptive re-use of historic structures, which does two main things: it preserves the structure itself, and allows for renovation of the building for modern use. This also means that rooms and floorplans are changed, so business like Architectural Antiques can come in to remove interesting and valuable elements to be resold and reused in different settings. It is a win-win. A small example of just this was the section of railing from the Metropolitan Building here in the store. In the future, you may have a chance to own a part of local and very pertinent history! (Can’t make any promises, of course). In the meantime, feast your eyes on some original railings from the Metropolitan! Some local sources say that there were some masonry in a warehouse in Delano from the Metropolitan building… so there are some remains of the building still floating around… supposedly! We love to see continued preservation efforts, but in a responsible way that promotes businesses, quality living, and neighborhood vitality! That idea, coupled with re-use of architectural elements in new designs, may be the future of how cities are built. A 10-minute short film about the destruction of The Met produced by University of Minnesota graduate students in 1961. Courtesy of The University of Minnesota Archives.